Leadsinger Marit van der Lei will join us at this year’s concerts! Welcome, Marit and Louise: thank you so much for the years you let us enjoy your fantastic singing and great personality! * Loosdrecht jazz festival: September 14th at 19.00 hr. August 25th at 17.00 hr. and 26th at 12.00 hr. in the beautiful South of Sweden! * Alice in Dixieland celebrates her 40th anniversary! * Painting of Alice in Dixielandby the famous poet and painter LUCEBERT (1991)! * March: next week we’ll finish the CD-Recording at O.A.P.-studio of Barry Olthof! The release of the CD will be in June. 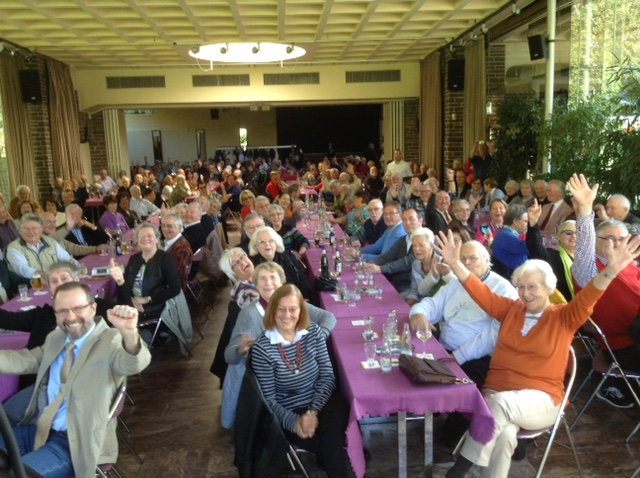 a very friendly welcome with Kuchen und Bier, enthousiastic audience and fantastic atmosphere! * A new idea to develop: we are setting up a new band, called Alice in Jazzyland, especially for our fans, who like the music of the swingperiod more than dixieland-music. Click HERE for the website. * Amaia went to Spain and South-America and we’re rehearsing now with our wonderful new pianoplayer Mi Jin Kim. We also decided to make a new Video-clip with short fragments of our music. You’ll find the definite plans about it later these months! * Yes! Amaia got her master degree at the Conservatory of Utrecht with a very inspiring final exam. She translated all jazzstandards in Bask language and played and sung it by herself, accompagnied by the nice musicians Hans Mantel-doublebass and Alexis Makatselos-drums. Congratulations! * Sadly the founder of jazzclub Uden – Edo Stouten – has passed away. A big loss for all, musically as personnally. The jazzclub members unfortunately decided to end all their activities. A sad story. * Yes, we found a very nice pianoplayer: Mi Jin Kim, from Korea. Welcome! will join us this year, because Louise has a big project to work on: “Fiere Vrouwen”; a theatrical concertprogram with only female singers, musicians, writers and composers. * Our pianoplayer Amaia has plans to live in South-America, so we were looking for a new female pianoplayer, who loves the oldstyle jazz and likes to travel through Europe! * A week with 38 bands and 400.000 people public! We played on one of the 8 steamboats, at the airport, at the Altmarkt, Lillienstein-stage, Open-air-stage and at the Parade through the whole city. A fabulous Festival! The enthousiastic public in Aachen! Thanks a lot!